This pasta was inspired by my Mom when I was complaining about not knowing what I wanted for dinner. She said, “Do you have pasta, a can of diced tomatoes, garlic and parmesan cheese?” I said “yes,” and she said, “Sounds like dinner to me.” It was dinner and it was great! I added a few more ingredients, but not many. 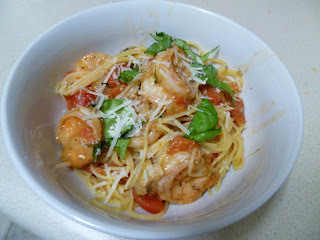 The finished product was the perfect summertime bowl of pasta that came together in less than 20 minutes! While bringing a large pot of water to a boil, dice the onion, cut the mushrooms in quarters and thinly slice the garlic. In a medium skillet heat about a tablespoon of olive oil over medium heat and add the onion and mushrooms. Cook them about 5 to 7 minutes, until the onion starts to become translucent, then move them over to one side of the pan. Season the shrimp with salt and pepper and add to the empty side of the skillet, let shrimp cook about 2 minutes on each side and then stir the onions, mushrooms and shrimp together. Add the garlic and let it all cook together about a minute or so. The water should be boiling by now so salt it and add the pasta to boil for about 6 minutes, until al dente. Pour the tomatoes and juices into the skillet with the shrimp. Once warmed through, about 2 to 3 minutes add drained pasta, top with parmesan cheese and stir all together. The tomato juice and parmesan cheese mix together to make the perfect light summer sauce. Spoon pasta, veggies, shrimp and sauce into individual bowls and top with additional cheese. ENJOY!